Directions: Cook wheat berries in 3 cups of water for 1 hour until tender; add more water if necessary, drain. Rinse with cool water and drain thoroughly. In the microwave on medium heat, cook onion, green and yellow pepper for 1 minute, or until desired softness. In a 4-quart pot, combine remaining ingredients with wheat berries and microwaved vegetables. On stovetop, bring to a boil and simmer uncovered 1 hour or until desired consistency is reached, stirring occasionally. 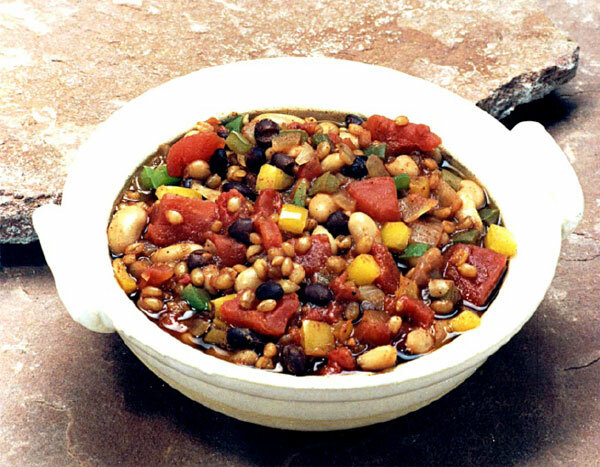 Wheat Berry Chili Meal suggestions: Serve with 1 non-fat dairy serving, ½ bread serving and 1 serving of fruit. Cutting calories while getting proper nutrition can be hard, expensive, and time consuming. Vi-Shape Nutritional Shake Mix offers you a fast ‘ideal meal’ that can save you money while providing amazing nutrition. To help you lose weight try one of our ViSalus Weight Loss Shakes for breakfast and lunch followed up by a sensible dinner, like this Wheat Berry Chili Recipe. I will cook this recipe later tonight… it looks so good.